"Do you want to try some crafting?" my guide asks. I suppose I should want to try some crafting, since I'm playing the Windows 10 version of Minecraft and crafting is pretty much the main activity. But I'm playing the Windows 10 version of Minecraft while wearing an Oculus headset, so hunching over a crafting menu and making torches sounds like the absolute least interesting way to spend my time. "No," I say. "I want to stand on something tall and look down." I've never used a VR headset before, and granted, Minecraft may not the best game for an inaugural VR experience. While it's always had a certain blocky beauty to it, it's not a game I really felt transported to, swept away by, even when using it in VR. I also didn't truly get to play Minecraft, it was more of a guided tour by a gentleman hunched next to me, telling me where to go and what to do. Walk here, push this button, follow this path, kill that zombie. Still, it was really cool. The VR experience in Minecraft immediately felt pretty natural and it didn’t take me much time to get acclimated in terms of walking and looking around, even though I’ve never used VR before. I was also happy to discover that VR doesn't make me motion sick, though I did feel a bit queasy the first couple times I tried jumping up and down. 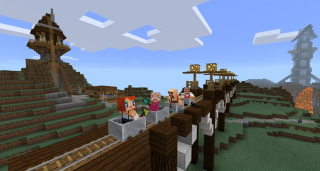 Riding a fast-moving minecart up a mountain, peering down into a chasm while standing on a bridge made of glass, or looking over the edge of a cliff, I never once got the urge to barf. The headset itself, I was pleased to find, fit pretty comfortably over my glasses, which is something I've been concerned about for a while. The issue wasn't comfort, as it turns out, but heat. It gets warm under that headset quickly, and within a couple minutes my glasses were a bit fogged up around the edges. As quickly as I got used acclimated to using VR in Minecraft, not everything worked that well. I'm a little thrown by using the right stick to turn my body. Rather than a smooth, realistic swivel, as when I turn my head to look around, using the stick to turn sort of clicks my view incrementally left or right. I was told this was how the feature was intended to work. From what I understand, turning your body in full motion can cause problems for players using VR. Maybe the system they have, these little incremental turns, ultimately works better, but it’s still jarring and somewhat unsatisfying. With everything else in the game moving fluidly—looking, running, jumping, falling—the incremental turning system really stands out and feels odd. Another thing that felt awkward was using my face in place of my mouse. To activate something, you place the crosshairs on it and push a button on the controller. It’s not hard to target something by aiming with your head, but certain things, like moving items around in the inventory, felt slow and clumsy. In a game like Minecraft with so much inventory management, especially during crafting, it just doesn’t seem like moving all those items around with your face instead of your mouse is going to be that enjoyable. It probably gets easier with practice, but I still can't imagine it not being a major pain to sort and stack all my items in those tiny inventory slots by craning my neck up and down. I came away from this demo thinking VR in Minecraft Windows 10 will be really good for doing some things and not so great for doing others. For something like my experience in the demo, in which I basically took a tour, I think it'll work quite well. Visiting massive Minecraft projects, touring some of the amazing structures people will build, seeing the sights, riding minecarts around, that will all be a lot of fun in Minecraft using VR. For the nuts and bolts activities though, for the long hours spent digging and tunneling and crafting, and especially all that inventory management, I just can’t imagine wanting to do that for very long with a headset strapped to my face and fogged up glasses.